George Hayes was a British artist born in Huddersfield in 1824 and working in Manchester and Wales. He was a versatile painter of landscapes, scenes with figures, seascapes and portraits. 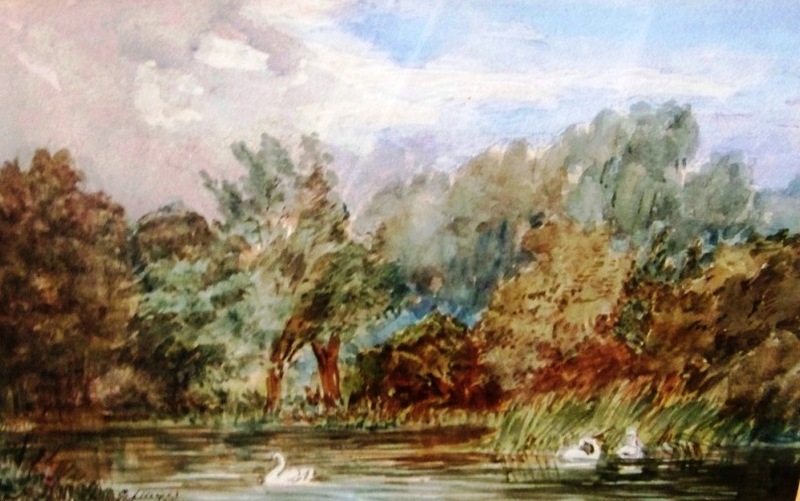 The signature on River with Swans matches the signature on his other works. Hayes was a member of the Royal Cambrian Academy of Art and was living in Conway, Caernarvonshire in 1881 and 1891, where he died in 1895. Many of his paintings depict scenes of Wales. He was very much involved in the local community - painting scenery for the amateur dramatic society and giving painting lessons. Newspapers of the time report court cases where Hayes was claiming money owed to him for a piece of art and for lessons he had given. He, himself, was sued by a builder for an unpaid bill. In 'The Wet List' column of The North Wales Chronicle of 1 July 1882, Hayes and his wife, Jane Ellen, were fined for being drunk and disorderly. He was one of the Manchester artists who found work as a designer in the calico printing industry. A Portrait of George Hayes by John Dawson–Watson at the age of 44 years. This lovely little watercolour is painted in bold and vigorous brushstrokes in a rather sketch-like impression of the peaceful scene before the artist. There is a marked contrast between the light colours of the pink and blue sky and the warm and rich tones of the foliage which takes up the middle ground of the painting. Shafts of light from above draw our eyes to the river below. The feathers of the three white swans stand out against the darker tones of the foreground. Hayes has skilfully created a balanced and harmonious composition.